In the kimono, there are a lot of class. The yukata is a summer kimono, a daily kimono, as a shirt. (Yukata can not put the traditional ceremony.) And, There are 2 kinds of Yukata: -To sleep or rest at home .. (As pajamas.) 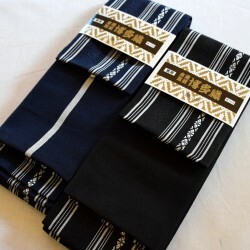 -For Out, we put with a traditional obi. We are all Yukata Yukata for went out, not to sleep. Yukata for man There are 6 products. 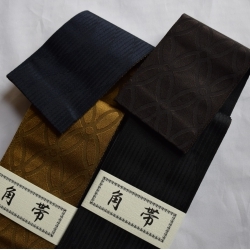 Hakata Kenjo Kaku obi Silk Black, Dark blue, Brown 100% Width 9.5cmLength about 350 cm For KIMONO,IAIDO and KYUDO. 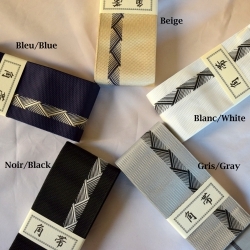 Silk Made in Hakata (Kyushu, Japon) Kaku obi traditional Our manufacturer MORI has existed for 120 years. WARNING! There are several manufacturers who sell cheaper but it is not authentic products.